Welcome to Exploring Different Brains. 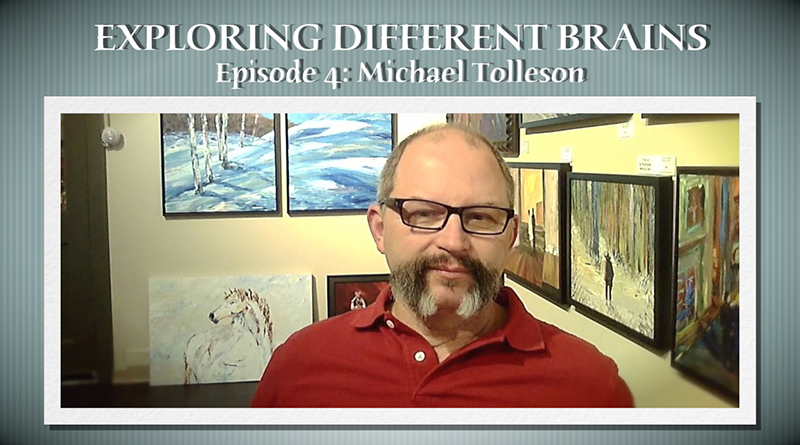 I’m Dr. Hackie Reitman and our guest today, Michael Tolleson, is an autistic-savant artist. Michael, welcome to Exploring Different Brains. Now, why don’t you tell our audience what autistic-savant artist means, and I’m using those terms because that’s how you describe yourself, I think. But if I’m messing it up, you let me know. No that–that’s pretty good, that kind of covers all of the bases. I’m autistic. I didn’t know until a few years. So I’m in my mid-50’s, late diagnosis, and I pop out paintings. I pop out paintings one after the other, all of them are gallery-worthy, since the very first one. So I have this ability, in four years to have created 700 paintings, and each and every one of them I create in under an hour. Now, our viewers are looking at your desk–at your gallery there, and behind you are some masterpieces. Were those all by you? Yes. Everything behind me is by me. Again, everything is less than an hour for me to paint. Some of them are published pieces, they have been in different books. The one piece that is right over my shoulder, at the bottom, is in a book by Dr. Tony Attwood. “Been There, Done That, Try This,” which is the Asperger’s advice book. So, I mean I’m having a wonderful life. It’s four years of just throwing myself out there. I actually have my own youtube channel. You can go in youtube, you can put in my name, so it’s Michael Tolleson, T-O-L-L-E-S-O-N. You’re going to find a variety of–of videos. There are videos where I’m on large stages, there is videos where I’m at conferences, benefits, but the most interesting ones are, I have–if you look up “Love in Autism,” under my channel, you will see me create a 5″ x 6″ birch painting, much like the one over my shoulder, but moonlight, which I completed in 35 minutes. It’s crazy, I mean–truly, I’m going to tell you Hackie; I’m a vessel. I’m a vessel, and whatever goes through me goes through me with the autism. I didn’t train, I have no reason to be able to paint the way I do, but I picked up a brush, liked to paint, and my third painting sold out of a Houston gallery for $4100. So I have just been producing painting after painting after painting, no mistakes, nothing that goes in the garbage, and I don’t even know what I’m creating. Let’s talk about your IQ, all right? You’re a pretty bright fellow. I’m not as smart as you. When I was eighteen, I took one of the few little Reader Digest tests for IQ, and it was like–I scored really high, I was like, “Oh, that’s kind of interesting.” So I thought, “Well, I want to, perhaps, see if I can get in MENSA, MENSA’s the high-IQ club with–you have to be in the top two percent, so I went and I tested in order to get in this club. So I have 154 IQ, now that’s through the roof–you have to–not only is that getting in the club, that means I’m like 10 points over what I need to get into the club. So that’s a huge, high IQ. Now I noticed you didn’t call yourself “Asperger’s.” You go out of your way not to call yourself Asperger’s, I think. I go out of my way in order to make myself someone that people can identify with. Truthfully, I’m different. I’m different than any other person on Earth. I’m unique. The ability to do what I do with the art–my brain, the way I process, the way I see light–all of it makes me unique, and I just think we need to break down barriers. I want for the autistic community to see me, identify with a piece of me and realize that there’s hope. There’s hope, inspiration, and–when they look at their children, I want them to understand that their children have a light in them. I have a light. I didn’t find my light until my 50’s. So when is someone going to look at their child and find that light within them? Or when is that child going to get to the point where now they are an adult and they find their own light without help? And I want people to see something that they can identify with within me. Now I understand that you do some mentoring of non-verbal autistic individuals who aspire to become artists. Tell us about that. So what we do is: I have a husband who is also autistic. We’re both Asperger’s. What we started to do very early was we started to work with the autistic community–this is even before we knew we were autistic. So we did it as a give-back, we were both creating art, we were both doing very well, we were getting in galleries, and what we decided is we were going to reach out to a community that needed us. And the autistic community needed us. So we started working with the kids–what we found was we had a communication with them like none other, and sometimes we understood them even more than their parents because we were them. Of course, at the time we didn’t know we were them, but for some reason we had that communication. If you are autistic, and particularly if you’re a non-verbal, to be able to come into a safe place where someone has no judgement, has no expectation of something that you can’t do and can see and hear you even though you don’t speak is a very important thing. So for those students, we work with them with what they like to do, the mediums they like to work with, and we challenge and try to help them create. Michael, you were referring to the fact that you were diagnosed very late. How were you diagnosed and–tell us a little bit about that. What I did is, when we first started looking at these children we’re going like, “Oh my gosh, we are these children.” And then we started meeting some of the Asperger parents and I was like, “Ut-oh, I’m a carbon-copy.” As we went through that process, we started online. We started to look at different online tests. Through the tests, one of them was pretty comprehensive. It had like 200 questions, it evaluated different aspects, and I scored very high. Jack scored very high. We both did. But we self-diagnosed first. Then, recently, I started to get to the point where I needed, in my own mind, to have an official diagnosis. I just felt, for one thing, I was throwing myself out into the autistic community and I wanted to be able to say, with verification, “Yes, I’m autistic.” So we have a–we have gone through some stress because of the town stuff and we got involved with some psychiatrists and some health providers, and during that process, I asked them to go ahead and evaluate me, so at that point they gave me the official diagnosis. Do you think your life would have been altered or easier or harder or whatever, had you been diagnosed earlier? I think I could have probably avoided some of the pitballs that I have, and I think I have a good chunk of about 20 years of my life that I self-medicated through alcohol and drugs, because I didn’t understand I couldn’t fit in. I didn’t understand I couldn’t make an entrance. I think that that period of my life, even though I pretended to be happy and social and lots of things, in actuality I was miserable, and I tried to buy my friends, and I think had I got a diagnosis early, I could have understood more who I was. So I think that, in itself, would have helped. There was a period of time right after I self-diagnosed that I was depressed over the fact I was autistic. Part of that came with the fact that, you know, with 154 IQ you think you can do anything. I just have to think through it and I’ll get through it. But the truth of the matter is, I have deficits. I can do crazy math in my head, someone can be adding up figures in front of me and I can add it up in my head–you know, upside-down and get to it, but I can’t do check books, calendars, schedules, anything mundane and repetitive. And when you come to the realization that the simplest of things are difficult, that is–that’s pretty impactful. You realize that you are handicapped in some way. And that caused some depression. And I’m at-ease with myself now. I realized that my deficits are offset by all of the assets I have through the autism. Now tell us how–how did you get into the painting? You can produce a masterpiece and sell them for signifcant chunk of change, I might add, at your gallery. And you can do it in like 35 minutes. So tell us that story. Well, the beginning of it is I was in middle school, and I was living in a small Texas town and about six or eight of the kids went off and we did an art lesson with a teacher who did pastel-portrait art. So we went and I created a green bottle with pastels. She looked at it and said, “Oh no, honey, there’s no purple in the shadows.” And I looked at what I had created and, in my mind, there was purple in the shadows. So I put down my pastel and I quit. I just quit–there was no reason for me to do art. If I couldn’t do art the way I saw it, I wasn’t going to continue. So let me get that straight: so you saw, in your mind, when you looked at what you had painted, you saw purple shadows. It belonged there. It just was supposed to be there. Even, in fact, for any of my paintings, any stuff behind me, there’s weird colors in weird places, but it works, it works because my mind sees it. And my autism creates through those colors. Now you can get like the birches behind me–you can get away from it and it really looks like birches and snow. You get up close to it, there is pink, there’s lavender, there’re blues, there’s all sorts of things going on. But that’s the way my mind sees it, and that’s how I wanted to create. You bring up a very interesting aspect, which is, we as a society, instead of trying to harness the hyperinterests and the abilities, right away, our first impulse is to make you like everybody else. Why doesn’t your brain work the way everyone elses brain does? This is the one-size-fits-all mentality that our school system, our workplace, our society in general, they have to get out of it. They have to embrace that it’s a wonderful thing that Michael Tolleson’s brain works differently, so his art is unique, just as he is a unique human being. And you, just so eloquently put it, that your brain sees it like this; your process is like this, and the net result is obviously very good. So why do you have to be forced to go from being a lefty to a righty? Humble, too. You’re humble, too, Michael. I am telling you from Asperger directness. But that’s the problem with us, we–you know, we’re given a job, we’re given a job to do one, two, three, but we want to do four on top of it, you know? So we want to do more, and we go into a job and it’s all laid out, like this is the way you do the procedure. But you look at it and you go, “But that’s not right, I can do it better.” So then you change it and then you threaten your boss, and then your boss thinks you’re after his job and you don’t care, you just want to do this job, so it’s crazy–we just kill ourselves at a job–and then, on top of that, we won’t hang out with them in their conference room and eat pizza and talk about tea-ball–so it’s–you know, it’s like were in trouble. No one ever gets warm and fuzzies about us and then we overproduce, so we kick ourselves out of jobs. You know that socialization is, many times, a big hurdle for someone who is autistic or has Asperger’s, and–how did you and Jack get together? I know. I’ve been a club DJ since my 20’s. So I–that was my thing and even after I quit drinking ten years ago, I still was club DJing. And it’s, for autism, and for Asperger’s in particular, where everything comes in at us all the time. If we can find something that we can focus on and be involved in, that kind of takes out all of the background noise. So when I paint, it’s like all I see is the canvas. Well, the same thing for DJing. When I would DJ, all I would know is the music in front of me and the music that I’m going to mix. So that was my hobby, and I continued to have that hobby, and the good thing about DJing is you’re in a booth, so you don’t have to socialize with anyone, but you have this energy around you, which, Asperger’s likes, we like watching energy and Jack just happened to come into the club one night before I was getting ready to DJ and there was a familiarity. That’s all I can say. I don’t know if I recognized the Asperger’s in him, I don’t know what I recognized, but there was something about him that was familiar, and we exchanged numbers, and both of us were at a place in our lives where we didn’t need anything. We had both come to terms with the fact that we were single, solitary entities that didn’t socialize well and that we just needed to be self-sufficient. And I think when you’re at that place, and you don’t need anything, that’s the perfect time to meet someone. You know, I’ve seen like a lot of young aspie people who, say are in college, doing well, but they would–it would be easier for them if they accepted accomodations they’re entitled to, like some extra time on the test, a quiet area to take it, but they don’t want to be stigmatized and their parents don’t. It’s kind of like, I imagine, being gay 50 years ago, you know, it’s much better to stay in the closet. It–here’s the problem: It’s like we’re–we all have our own “norm.” Every single one of us has their own normal. You have a little place on your, and it itches, and you’re the only person that has that itch, or you have the only–you have a particular taste that you really enjoy food, or whatever–but it makes you unique, it makes you, you. I have a particular way I think, I have a particular way I walk up to a canvas. That’s my normal. The children we’re talking about, they have their normal. And they may think a certain way, they may need a little extra time on their test, that’s their normal. When are we going to see each other and say, “I respect your normal?” Because it feels normal to us. So for us, normal is normal. So it just so happened that some normals match a little closer than other normals, but it’s our normal. And everything that you do, everything that you feel when you get up in the morning, for you, is your normal. 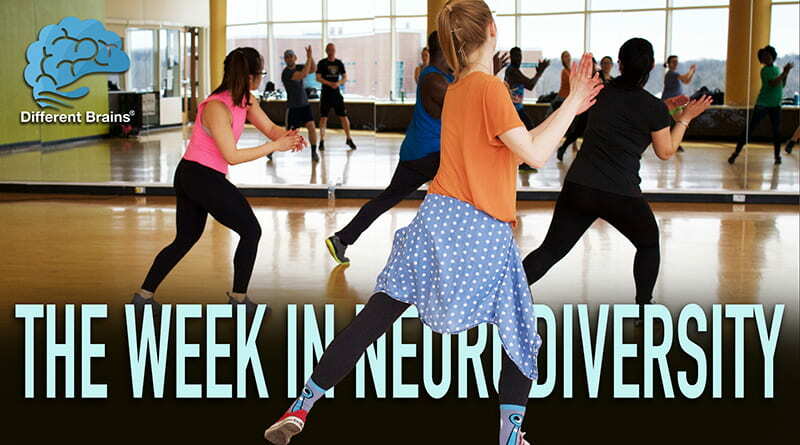 It doesn’t feel out of place, it may be some–a little quirk you have, but it’s normal to you. So our normals need to be respected. If we can do that, the person that needs a little extra time on their test is not stigmatized. If we can do that, the child that may flap or skim a little is not going to be stigmatized because that’s their way of processing. Or, someone like me, who is a verbal processor, if I talk my rear-end off, because that’s the way I think, on my tongue, then I’m respected for who I am. What I did is–I don’t paint things, I can’t paint things. I paint feelings. So the way the autism works with me, I look at something visual. A picture or something and I feel it, and then the autism converts it into a painting. And I’ve said this before: I’m a vessel, I’m a vessel for the autism. I don’t know what it’s going to do, I don’t know what it’s going to paint, so the autism paints this painting. So what I do is I create these paintings, and I create paintings that are emotional. And more and more I created these paintings, and the more I put them out on facebook for people to see, the more people became engaged with it. And then I started writing stories because I wanted them to know what the story was behind a painting. As I started to get this collection of paintings and writing, I started getting the feedback that they wished they could have them in a way that they could keep them and refer to them. So at that point, I thought, “Okay, this is what I need to do. On top of this journey that I have in public, I need to have a physical presence within the world.” So I did a book with 135 paintings. The stories that go with those paintings–and these are–could be the inspiration for a painting, could be my view on the world that links to the painting, could be some self-revelation that’s in the painting, but each and every painting has 300-600 words with it in order to basically help the journey. Now what I’ve read in your book and looking at the paintings, and it’s an amazing thing, I don’t think I could have understood it until I saw how you paint–you know, watching one of those videos. It’s not–it looks like the film’s in fast-motion or something or time-lapse, but it’s not. And, you know, putting it all together with connecting all the dots of how all of our different brains work, what I admire most about you, Michael Tolleson, is that you are harnessing the gifts that God gave you and trying to help other people without being a goody two-shoes, because it’s kind of selfish, because it makes you feel good. When you’re mentoring these non-verbal autistic people who aspire to become artists, when you’re creating your expression through painting and creating your art, when you’re here on Exploring Different Brains, you’re helping other people, and, for that I salute you. I do have some questions, though, about your mustache. How did you get to that mustache, that’s what I want to know? That’s very very inspirational. It really is. Please tell all of our audience how they can find you online, how they can get in touch with you, how they could ask you to become a speaker at their organization. Tell us all of the ways to get ahold of you. There’s a website, it’s MichaelTollesonArtist.Com in order to get into my website. But if you really want to see the videos and you want to explore, perhaps, me being a presenter at your function, you should–for any time I speak and present, I will paint a painting live, I think that’s important. I can talk about the gifts of autism, I can talk about what I do, but for someone to sit and watch a painting unfold in ten minutes and be able to see the wonder of autism in front of them, it’s incredible. So if you want to explore that, you can actually go onto my website BookMichaelTolleson.Com, and they’ll be just my standard contracts and information about me, it’s just ways to explore what I can do for you. And if there’s an organization that needs me, even if we need to have some dialogue about how to get me there, how I can help, I’m open. I’m really open to any way to be out in the world. I’m on facebook, probably between Jack and I we have about 15,000 people that are involved and connected with us, and that’s all happened within four years. So if you–you can get on facebook under my name, Michael Tolleson, or you can also look at the art under the Art of Michael Tolleson. We also have a facebook page for the art gallery and the mentoring. That’s a Michael Tolleson Savant Art Center. So within the art center, the physical property of it, we have an art gallery that we show off the art. We have our art studios and then we have the mentoring center that we work with the kids. Tell us the name of your book that’s not yet published but will be available, probably in the next book season, I would imagine. So the name of the book is: “Soul Walking: My Autistic Journey on Earth” and I’m expecting the book to be out in between probably March to May, somewhere in that vicinity. The book is about my paintings and also my stories about the paintings. Some people may find they identify with some of the stories, some of the paintings, but it’s how I see the world. And it’s not meant to be right or wrong, it’s just meant to be how I process the things around me. Well, Michael, it’s been a pleasure talking to you today on Exploring Different Brains, thank you so much, thank you very much. (15 mins) In this episode, Hackie Reitman, M.D. 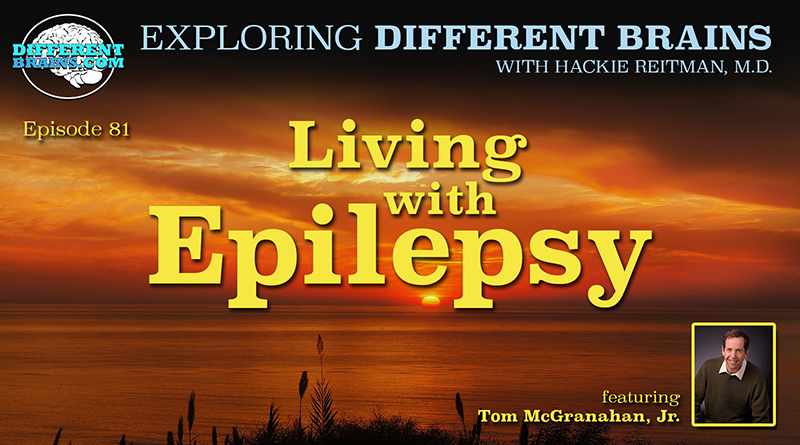 speaks with Tom McGranahan, Jr. Tom has epilepsy and is a tireless advocate for awareness of the condition, and is also the author of Under Siege: Epilepsy in the Open. 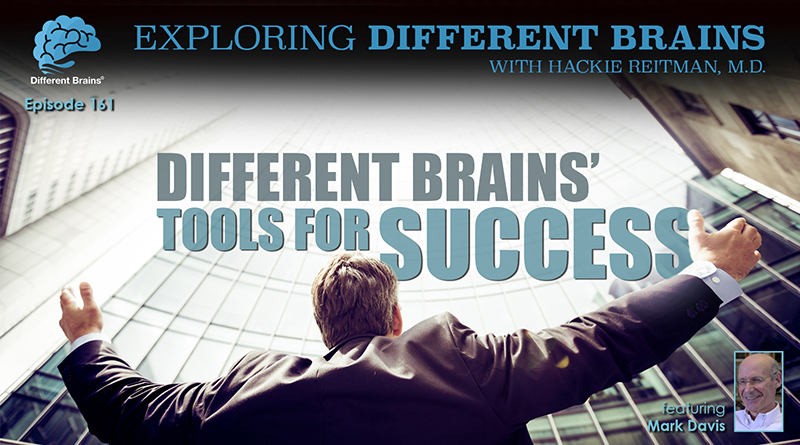 (25 minutes) In this episode, Dr. Hackie Reitman speaks with entrepreneur Mark Davis. The two discuss Mark’s keys to success, and cover tools for accomplishing tasks and maximizing potential.